Teasels are also commonly spelled Teasle, Teazle and Teazel. The Fuller’s Teasel (Dipsacus Fullonum) was formerly widely used in textile processing, providing a natural comb for cleaning, aligning and raising the nap on fabrics, particularly wool. The dried flower heads were attached to spindles, wheels, or cylinders, sometimes called teasel frames, to raise the nap on fabrics (that is, to tease the fibres). By the 20th century, teasels were largely replaced by metal cards, which could be made uniform and do not require constant replacement as the teasel heads wear. However, some people who weave wool still prefer to use teasels for raising the nap, claiming that the result is better; in particular, if a teasel meets serious resistance in the fabric, it will break, whereas a metal tool would rip the cloth. Teasel growing was introduced into Yorkshire in the middle of the 18th century in order to supply the growing woollen industry in the West Riding. The plant prefers heavy clay soil as found in the Vale of York and the proximity to Leeds, which was the main market for Teasels, gave the area an advantage over the traditional growing area in Somerset. However, the volumes grown in Yorkshire never outweighed those from the West Country as the warmer climate there allowed a longer growing season. Although, at its height, the growing district in the Vale of York was quite extensive the main growing area was centred in the area around Sherburn in Elmet and South Milford. Maximum production seems to have been around 1850 and owing to increasing competition from imports and declining demand, the industry died out almost completely very early in the twentieth century. The organisation of the growing trade was largely determined by the peculiarities of the plant. It is a biennial requiring two years to reach maturity and it takes a lot out of the soil and therefore had to be rotated. It was labour intensive, requiring repeated weeding with a long wait of 18 months or so before any return was likely to be seen. The risk of loss remained to the very end, for damp weather at the time when they were ready for cutting would rot and destroy the crop. This, in addition to the vagaries of market prices, made the business a notoriously speculative one. It was for this reason that the trade was dominated by professional growers often known as ‘tazzle men’. The farmer would provide the land at an agreed rent, plough it before planting the seed and hoe the plants on one occasion. The grower assumed responsibility for the investment and arranged for all the other activities necessary some of which may be provided by the farmer under a separate agreement. Part of the attraction for the farmer lay in the fact that the intensive and repeated weeding cleaned the ground for the following crop, usually winter wheat. The growers had to have some capital to put at risk and the freedom to see the crop through its two years in the field and then arrange for its harvesting, drying and marketing. They were often farmers themselves or sometimes shopkeepers, butchers or innkeepers. Local growers included the Bortofts of South Milford, the Broomheads of Sherburn and the Wrightsons of Church Fenton. Harvesting the crop began in July or August when the purple coloured blossom on the ‘king’ teasel at the head of the main stalk had fallen. Every effort was made to cut the stalks as they became ready. Many of the cutters were women, however children and other casual workers were brought in during their holidays from other jobs. The ‘queen’ or intermediate growth was cut next and then finally the basal ‘buttons’, which although worth less were also carefully collected. Each teasel was cut with about 9 inches of stalk and made up into bunches of 50 with the last one cut with a longer stalk with which to fasten the rest. Before the end of the day they were collected by men who went along the rows with poles, onto which they pushed the bunches. 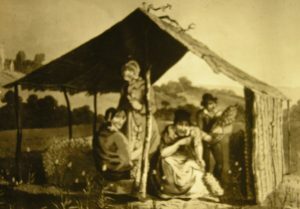 They were stored under cover to dry in temporary wooden sheds or ‘ellums’ constructed with poles, open sided with the roofs made of brushwood thatched with straw or canvas. The illustration below shows an ellum with Sherburn church in the background. When completely dry, the teasles were moved indoors to be made up into traditional ‘stavs’, or to be boxed. In some cases, growers rented empty barns. However some had purpose built storehouses of their own. James Bortoft & sons had their own shed in South Milford for the teasels they grew, purchased and probably also imported. Making up began with the opening out on the floor of the dried bunches from the ellums. The projecting sepals were then cut off with scissors. The ‘maker up’ was often an elderly man. He first took six larger and four smaller teasles, arranging them in a fan. The stalks were then tied with a piece of green willow, the completed bunch called a ‘glen’. The glens were then pushed onto a hazel rod about 4 feet in length, which had been split almost to one end. The first ones formed a circle and then gradually built up into a cylindrical shape or ‘stav’ containing 30 glens in all. They were then made up into packs of 45 stavs, so that each pack consisted of 13,500 teasles. Later on the teasles were sometimes boxed according to size and with the stalks trimmed to the length specified by the receiving mill. The principal commercial centre for Yorkshire teasels was Leeds which had become important for manufacturing superfine broadcloths, which required a heavy consumption of teasles. Each year dealers from the Yorkshire growing district, along with others from the West country, waited on orders from the cloth dressers at a number of inns in the town. After the middle of the nineteenth century the supply trade seems to have come increasingly under the control of a small number of merchants who were acting as middlemen between growers and consumers. One of these was South Milford dealer James Bortoft whose firm handled much of the Yorkshire supply trade up to World War 1. Although rail transport was used to deliver the teasles to some extent, the normal way was by road. Horse drawn wagons would leave early in the morning to deliver to Leeds or the Wakefield area, returning that evening. In the 1911 census there are a total of 56 farms listed on the census returns making up the three Enumerator Districts of Sherburn and South Milford Parishes. This demonstrates the enormous changes over the last 100 years in the way the land is farmed, from labour intensive small holdings to the large, highly mechanised farms of today. In 1911 26% of local employment was in farming. Milford Lodge William Morley Common Lane, SM close to Gascoigne Wd Jn. On the 24th May, Alistair Cross, the archaeologist in charge of the dig that was undertaken before work started on the housing development, gave us a presentation describing what had been found. The site had numerous lines of ditches and pits indicating that it was a considerable settlement. A large quantity of artefacts were unearthed including pottery, coins and jewellery. There was also a number of skeletons. All of this evidence is currently being studied but indications are that the settlement dates approximately between AD 50 and AD 350. They also discovered pits and structures that were probably used for grain storage and drying, indicating that the settlement was mostly agricultural. There was no evidence that habitation of the site continued beyond the Roman period. We now look forward to the results of the analysis of all the evidence which we are anticipating will be the subject of another presentation to the society in November.